The Shard at sunset – London, photographed in early May 2015. Here’s our second ‘Right Click’ photography post, it’s about that time a total stranger let us into his apartment so we could photograph The Shard at sunset. As photographers, every now and again we capture an image where the process behind the ‘click’ is almost more interesting than the photo itself – this is what ‘Right Click’ is all about, revealing the story behind the picture. Today’s topic image (above) is The Shard, the dramatic new, 309.6m skyscraper in London, photographed in early May 2015. Sharon and I had been out and about the whole day photographing London. 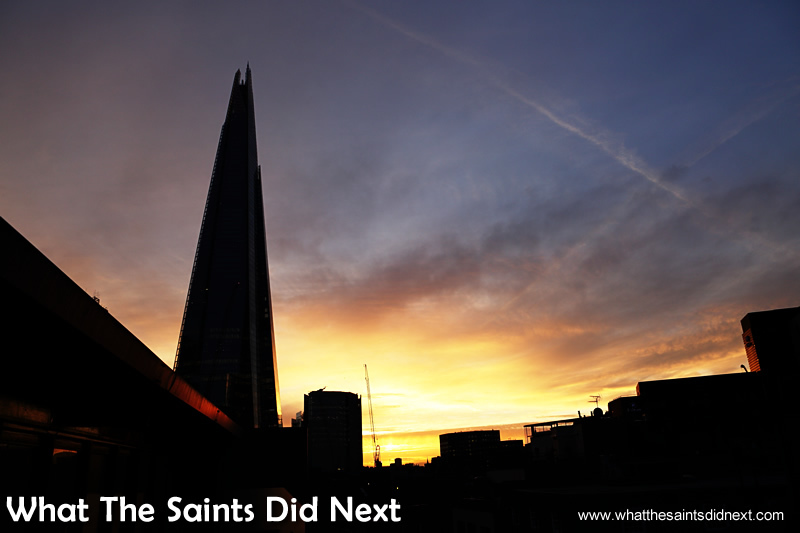 We then moved into the London Bridge area hoping to capture The Shard backlit with a sunset sky. It had been a clear day so we were hopeful. After exploring the warren of back streets behind London Bridge Railway Station, we slowly realised the combination of narrow streets and three or four storey buildings made it virtually impossible to get a clear unobstructed angle of the glass spiked building. We could only catch a glimpse of the top half of The Shard. We found ourselves standing outside a three storey apartment building thinking, if only we could get to the roof we might get a better view. Unfortunately all the buildings required key code access. The Shard – Some of the partial views we were stuck with from the low street level. Photographing The Shard at sunset. Just then a resident cycled up to the front door and began compacting his folding bicycle, preparing to go inside. He smiled at us and somehow we got chatting; his name was Juan. We explained our predicament and asked if he would help. Deciding we were probably the okay type of ‘crazy’ people, he let us into the building courtyard. We could see the Shard better, but it still wasn’t quite good enough. I could tell Juan knew the angle wasn’t brilliant and he was sizing us up. I fixed my best pleading face and after a few moments he said, “Well I do have a view from my apartment, it’s not great but you can try.” Woo hoo! Up we went in the lift, into his apartment, through the bedroom and out onto the balcony. It wasn’t an unrestricted view, but it was certainly a lot better than anything we had previously. It required me climbing partway up the railing, overlooking the street three storeys below. If I had been braver I would have gotten an even better angle, but I know my limits when it comes to heights. Thanks to Juan’s generosity we managed to get our Shard picture. Photographing The Shard at sunset. 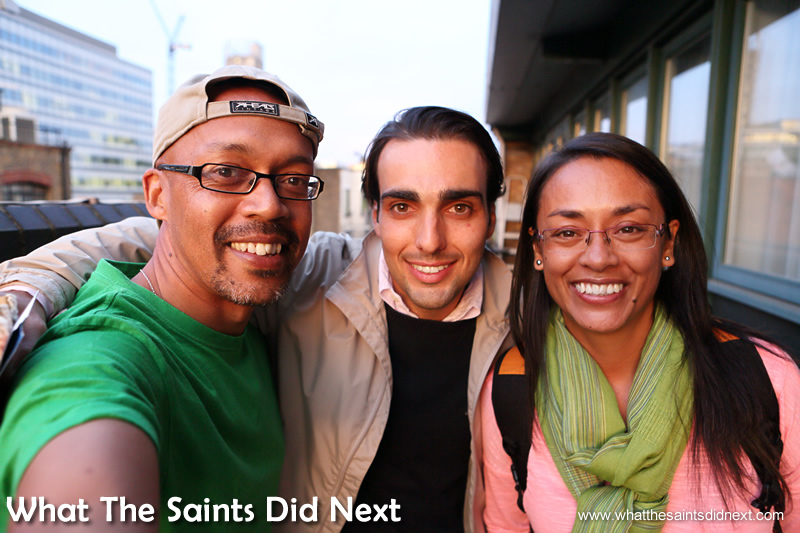 Afterwards we told Juan about St Helena; we learned he was Spanish and had been living in London for three years. We did a selfie together and then went on our way. This picture of The Shard at sunset for us, sums up the spirit of London: Modern, cosmopolitan and beautiful, and when you slow down to take a closer look, is home to some amazing people.